Tuesday 4th July 2017 - Fine all day but with heavy cloud and very misty in the late afternoon. This morning we left the Berehaven Golf Club on the Beara Peninsula and headed for Mizen Head on the 5th and final finger of this part of The Wild Atlantic Way. However, in so doing we missed out the fourth Sheep's Head finger - partly due to lack of time and partly because the road system didn't seem to be suitable for T4rdis2. Our first stop was just outside the town of Bantry where we overlooked the 'Blueway' (starting point for three kayak trails) on the seaward side and the Abbey Cemetery rearing up in front of us, and here we had a bit of a history lesson. First, we learnt about the origins of the long boats that take part in The Atlantic Challenge. In December 1796 a French Armada of 48 ships and 13,000 troops under the command of General Hoche tried and failed to land at Bantry due to adverse weather conditions. Most of the Fleet returned to France but a ship's longboat and her crew were washed ashore on Bere Island. The sailors were quickly apprehended by local yeomanry and the longboat was abandoned in a boathouse at Bantry House - and there it lay for 150 years until it was presented to the National Museum of Ireland. Then in 1980 an organisation called Atlantic Challenge International began building and racing replicas of the 38 foot Bantry longboat, and now over 16 countries with 70 replicas of the original take part in the biennial Atlantic Challenge Contest. The other thing we learnt about were some more heart rending facts about The Great Famine that lasted from 1845 - 1847 and during which time over a million people starved to death and another million and a half emigrated. 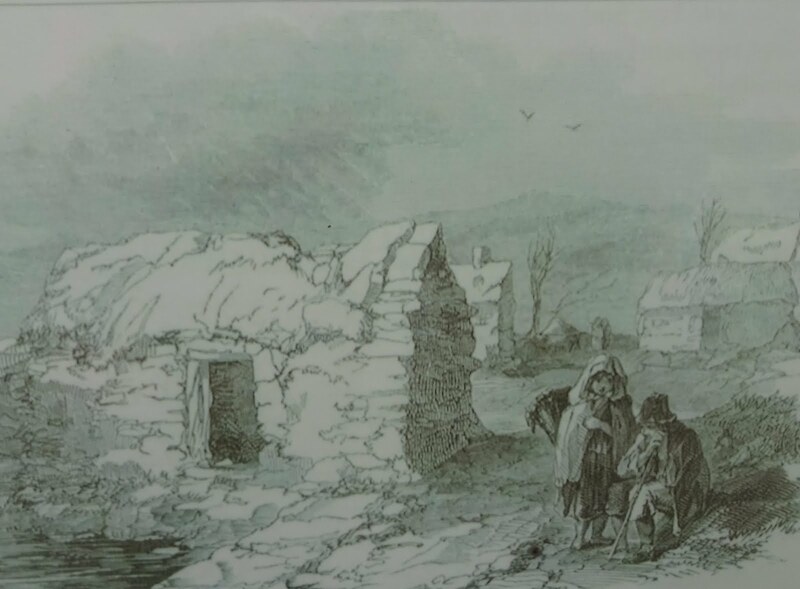 The info boards told of the terrible living conditions in the area 'poverty, disease and filth everywhere with all the main roads into the town being lined with hovels' - and into that situation came the dreaded 'Blight' which is described as ' the greatest catastrophe ever to befall this country'. The potato was the only food for the vast majority of the Irish population and Bantry and Skibbereen were two of the worst hit areas - thousands died locally of malnutrition, fever and starvation even though enough corn, beef, butter and pork were exported ' as would have fed the entire population of Ireland'. The catastrophe happened because throughout Ireland the land was held almost exclusively by absentee landlords who leased it to middlemen, who in turn divided it and let it to farmers. The farmers divided it again and sublet small patches of about an acre to cottiers and labourers, and on this they would build a hovel and grow potatoes. An adult would eat from 7 to 10 pounds of them every day - so a family of two adults and four children would get through a total of six tons a year which was the amount one acre could produce! The graveyard we were looking at was that of an Abbey where some of the famine victims were buried in huge pits - now marked by a tall cross. Outside the town whole families were often found dead in their hovels, and when this happened the cabin was sealed and became their family tomb! Once we'd absorbed all this info we continued our journey towards Mizen head, but on the way we passed by the unbelievably beautiful Barleycove beach. Unfortunately we couldn't get very close because the car-parks were guarded by height barriers, but from the hillside above we could see the lovely white sand bay that was surrounded by gently sloping hillsides and dunes with the pale blue ocean gently lapping on the shore. And from there (about 5 miles to go) our onward journey became a bit more exciting - the roads became narrower, bumpier, twistier and in places steeper - and when a big lorry came around a corner barrelling quickly towards us I let out a little shriek of fear! However, I needn't have worried because my trusty driver just popped us into reverse and drove backwards for about 100 metres to a passing place that just allowed the lorry driver to scrape by! Luckily after that we didn't meet any other 🚌 or 🚛 so we were soon settled in the large parking area for Mizen Head where we planned to spend the night! And really I think Mizen Head's story is best told with photos - although it would be impossible to do this wild bit of coast justice even if my name was David Bailey! 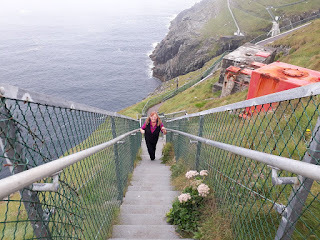 Mizen head is the most southwesterly point of Ireland and it's described as giving 'an edge of the world feeling' - and without the provision of The Footbridge, along with the many walkways and staircases it would probably be inaccessible to most people. Therefore, we didn't mind paying the small admission fee to cross the bridge and explore the magnificent cliffs that have been contorted by the action of the waves. Really the only way our pleasure could have been enhanced would have been if the weather had been better - while we were there the mists rolled in, and had we arrived any later many of the stupendous views would have been obliterated. The hazy bit at the top is the fog rolling in! John says we climbed over 300 steps all told! Mizen Head Signal Station was built in 1909 and was originally just a fog signal station - and even though a light was added later there has never been a proper lighthouse here. The light is mounted in the open on a freestanding pedestal, and forming a backdrop to it is a 4 metre octagonal concrete structure. Nowadays, the buildings house an award winning Maritime Museum and Heritage Centre that provides a fascinating history of the area that includes a lot of info about ships that have been lost on the rocks. One of the other things that was presented while we were there was information about Fastnet and it's Lighthouse. The Fastnet Rock is the most southerly point of land in Ireland - and on a clear day it would have been visible from Mizen Head - but it certainly wasn't today! The lonely outcrop is locally known as the Teardrop of Ireland - as it was the last bit of Ireland that emigrants would see on their long trip to America. The lighthouse that stands on the rock now is said to be one of the best designed beacons in the world, but it isn't the only one that has been situated there. The first one was built in the 1850s but it wasn't considered robust enough. The current tower is built of Cornish Granite, and for it's time (early 1900s) it was an incredible feat of engineering. Construction started in England in 1899 with 2,074 numbered blocks (weighing up to 3 tons each) being assembled into the tower as a practice run. They were then disassemble and brought to Ireland where the process was repeated on the Fastnet Rock. Apparently the whole process took 5 years, and since then it would seem likely that the lighthouse has saved countless lives. Once our visit was complete we retired back to T4rdis2 where we had hoped to do a bit of wave watching as we are parked well above the ocean on the South side of the peninsula. However, even though the sea is only a few metres away it is almost obliterated by the dense mist and very little is visible! Maybe it will be better in the morning! Wednesday 5th July 2017 - Pea Soup in the morning but brightening to a lovely sunny afternoon! If anything the fog got worse overnight, so by this morning visibility seawards was almost non existent, and the road way wasn't much better. However, we wanted to get down the twisty turny hill before any tourist coaches started to ascend so an early start was in order. Our first stop was just outside the village of Schull💀- not named after the cranial appearance of the mountain behind it but for the medieval monastic school that once stood there! But we hadn't really stopped off to see the village - a little beyond it was the Toormore Alter Wedge Tomb that dates back to about 3,000 BC. It's built from local slabs and is one of a dozen on the Mizen peninsula, and it's said that it's entrance was deliberately lined up with the distant Mizen Peak. Apparently people have worshipped here since it's origins, but more recently in the 18th century Catholic priests said mass here when it was illegal to conduct the services in church. Our next stop was the hamlet of Ballydehob where we found another accepted 'WildCamp' spot on their mostly disused harbour. It really was a pretty little place right on the water's edge of a small estuary, and had it been later in the day we may well have called it home for the night. However, it was only about mid-day so other than a quick stroll around we were soon on our way again - but we did catch this chap taking a pic of their 12 arch disused railway bridge. From there it was forwards and onwards to our final resting place for the next few nights - The Hideaway Campsite at Skibbereen. The site is quite pretty but the town itself turned out to be a bit of a dump disappointment in it's unkemptness - but as we plan to cycle out of it on both full days we're here it really doesn't matter! Thursday 6th and Friday 7th July 2017 - Both days warm with lots of visits from Mrs Sun! We've spent the last two days cycling around this last part of The Wild Atlantic Way, and really our time here has probably served as a bit of a wind down as our Irish tour is coming towards it's end. This part of the coast is less dramatic than some of the other counties, but in it's own way it's very beautiful with loads of little coves, and bays, as well as an abundance of small islands dotted about just off the coast. On Thursday we headed first for the very peaceful Lough Hyne, and then continued on to the town of Baltimore where we spotted a cafe offering 'Cape Cod 🐟 and chips - but on this occasion we didn't indulge! Lough Hyne is one of Ireland's few salt water lakes - apparently a narrow bottleneck known as the Rapids joins the lake to the sea, and this is also the location of a very unusual tide. The shallow Rapids allow water to flow into the lake for 4 hours, but it flows out much more slowly - over an 8 hour period. This means that even after the Atlantic tide starts to rise again the water level in the lake is still dropping - until the moment when the two levels meet. Then for less than a minute, the current comes to a complete standstill - and it's said that at that moment the sea and the lake seem to be holding their breaths - and if you were there waiting you'd never forget the event - however - we missed it! But we did take the time to sit and watch a hungry heron stalking his dinner. Once we got to Baltimore we paused to admire the natural harbour which is formed with Sherkin Island and Cape Clear, and it was there that we learned about The Sack of the town! It's said that in 1631 much of it's population was carried off by pirates never to be seen again! And while we were there we also toddled along to see The Baltimore Beacon which has stood above the western end of the town since 1849, and from here we had spectacular views out into Roaring water bay. We then did a quick circumnavigation of the remote Ringarogy Island (which is connected to the mainland by a bridge), before nipping home to lap up some of the late afternoon sunshine. Friday's ride took us away from Skibbereen, initially towards Toe Head and Tragumna where some more lovely coastal vista's greeted us as we went. We also learnt that buried beneath the waters in these parts is an almost intact German U-boat that was scuttled after being damaged by a mine, and additionally, there is also a ship called The Kowloon Bridge. Apparently she is one of the worlds biggest wrecks and she sunk in 1986 when she broke her back on Stag Rock after her crew abandoned ship in a storm. Next came Castletownshend with it's very big hill down to a tiny harbour - we new it was steep when we saw this sign, and I did comment to John 'I'm glad we're going down and not up' - little did I know - all that was at the end was drop into the sea - and the only way out was back the way we'd come 😂😂😂 - it's a good job I ate my scone at the bottom cos I certainly needed all the energy it provided! Once we got to the top we continued on our way to Unionhall - another little hamlet that sits on a fjord like bay, and a place that provided us with another pretty dining room. Over the water we could see the settlement of Glandore - not a place we'd planned to visit, but one we were forced to later in the day! When we'd scoffed our picnic we headed for home thinking we'd have another lazy afternoon - but when we got there John read a text message from his sister Val - informing us that I'd lost my phone! At that stage I hadn't even missed it, but a very kind chap had found it in the middle of the road and rung 'Mum' with his contact number. I rang him back from John's phone and he said he was working in Glandore - if I'd realised I'd lost it earlier we were only a very sort distance away, but now we had to traipse back about 8 miles to collect it. So we debated if we should go on our bikes (which had already been packed away ready for travelling tomorrow), or if we should go in T4rdis2 - and as we'd already ridden 25 miles the latter won out. In the end I was just hugely relieved to get it back - I've got so much info stored in there I would hardly know where to start, and that's not to mention all the very precious videos and pics! Anyway, my little tale of woe ended happily - and I only got very slightly told off for my carelessness! But, as we all know, the way to a man's heart is through his stomach, so I made up for being a pest by cooking a lovely chilli with rice and garlic bread - that soon soothed a grumpy temper!